The Pearl River Delta’s Plastics Problem! Ecowatch have reported that large amounts of plastic waste and debris have been washing up in bays and on beaches all over the Guangdong and Hong Kong region in the past few months. You might not think that there is anything special about this, as, unfortunately, there is a lot of careless and illegal dumping of both industrial and household waste, not to mention offshore marine dumping by ships not wanting to bother about environmental and discharge levies in their ports of call. However, this appears to be a little different, due to the unprecedented amounts of plastic waste that have been discovered, with the South China Morning Post stating that government departments have collected over 72,000kg of waste between July 1st to the 9th. Clearly, this is not just general dumping by locals and companies who don’t want to pay to dispose of their own waste and the likelihood is that this plastic and other detritus has been washed down from streams and rivers throughout the Guangdong region due to heavy rainfall throughout the wet season. It does, however, lead us to questions about waste disposal in the region and the manner in which both the authorities and also the citizens care about their own environment and the impact that industry and over population has on places a long way away from the area. Clearly, if the plastic and other waste was not removed and processed correctly, then it would just float away somewhere else and then be another community’s problem to sort. The plastics involved are also likely to last a long time, will not be biodegradable and will float for thousands of miles before eventually reaching another destination It has even been said that so much plastic has been washed down in the Pearl River Delta recently, that it can be seen from Space! It is important for all manufacturing companies and their customers to ensure that the items that they produce and the materials with which they produce them are environmentally sound and taking advantage of the latest technology. 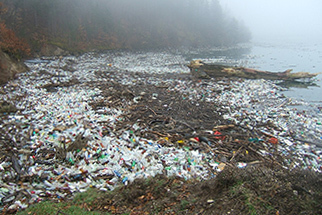 Biodegradable plastic should be the first choice for any environmentally-aware production run, although even this can cause problems; a large amount of marine contamination is now being caused by micro-plastic and plastic beads, which have a catastrophic impact on marine life, working their way into the food chain and poisoning us and our families. Recycling schemes, run by both local and national governments for household and industrial waste, allow every citizen to ensure that what they discard will not end up floating along someone else’s beach many thousands of miles away. Taking responsibility and worrying about where our products go after a consumer has finished with them is our responsibility and will make the entire Earth a cleaner, greener place!